The Mysore Palace is a magnificent edifice located in Mysore in the state of Karnataka.Also known as the Amba Vilas Palace,it is the former palace of the royal family of Mysore and is still their official residence.Referred to as the ‘City of Palaces’,Mysore houses seven other places,but none come close to awe – inspiring grandeur of this palace.Mysore Palace was built in the year 1912 for the 24th Ruler of the Wodeyar Dynasty and is counted amongst one of the biggest palaces in the country.The construction of the Mysore Palace was orchestrated by the Maharaja Krishnaraja Wadiyar IV referred as “Rajarishi” (saintly king) by Mahatma Gandhi. The Mysore Palace is built in the Indo-Saracenic form of architecture which is an exquisite blend of Hindu,Muslim, Rajput and Gothic styles of architecture.The Indo-Saracenic architecture was an architectural revival movement by British architects in the 19th century,drawing elements from Indo-Islamic and Indian architecture mixed with Gothic and Neoclassical styles.It is a three-storeyed stone palace with marble domes and has a 145 ft tall five-storeyed tower.There is a large garden surrounding the palace. 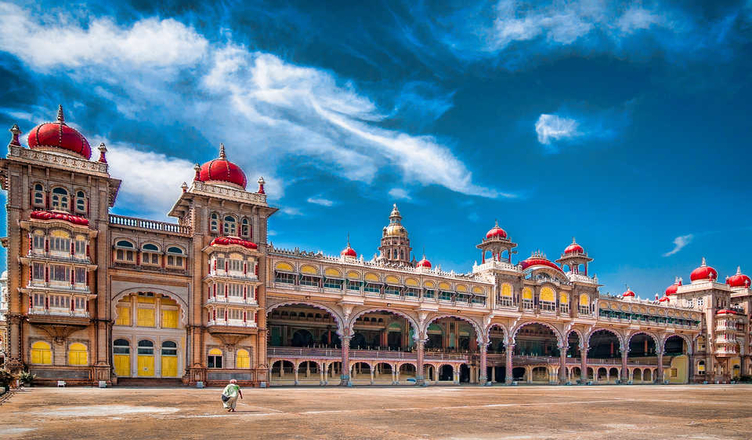 An impressive light and sound show takes place at the Mysore Palace every day in the evening except for Sundays and public holiday.The show is inclusive in the ticket prices and is held every day from 7:00 PM to 7:45 PM. Vijaya Dashami is the major festival that is celebrated every year in autumn.The festival is celebrated for about ten days, and the main attraction of the festival is a parade march by the elephants. Mysore junction railway station 1.4km.